The sign hanging outside this restaurant in downtown Halifax in Nova Scotia, Canada is brightly decorated which catches people's eye as they pass by. This restaurant is known throughout Halifax for its delicious seafood meals as well as a variety of pastas, steaks, chicken dishes and amazing desserts. McKelvies restaurant is located along the waterfront in downtown Halifax where people can enjoy a fabulous meal while taking in the scenery and the evening sunsets. 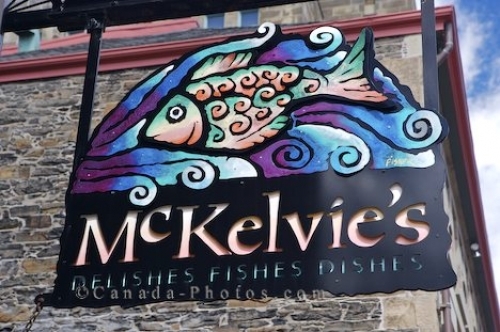 Hanging Sign for McKelvies Restaurant in downtown Halifax, Halifax Metro, Halifax Harbour, Nova Scotia, Canada. Picture of a sign advertising for McKelvies Restaurant in downtown Halifax in Nova Scotia, Canada.